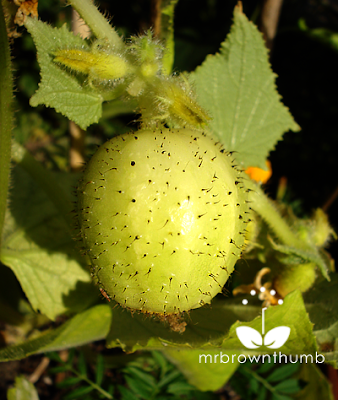 This past spring I got lemon cucumber seeds from Botanical Interests to grow in my garden. I decided to try the lemon cucumber seeds chosen because I'd never eaten one of these cucumber varieties before. Due to a series of gardening setbacks, I may not get a chance to eat a lemon cucumber this year, but I'm enjoying growing them. I started my cucumber seeds late and then pretty much neglected the seedlings and planted them out even later. By the time the cucumber vines were about 10 inches long they were covered in blossoms, but there weren't many bees working in the garden. I watched as the blossoms unfurled, then withered without any signs of fruit being set. I panicked and started to hand-pollinate them, which has worked marvelously. Take that, stupid bees. Lemon cucumber blossom & leaf. At some point last year I ran out of bamboo sticks to use as stakes in the garden and haven't gotten around to buying any more. So, I turned to my second favorite method of creating garden stakes. This lemon cucumber vine is container grown and climbing up a couple of dried allium stalks from my garden. Which reminds me to buy more alliums this fall for the garden. Alliums have great flowers, but I like the dried stalks the most for they remind me of fireworks. One of my lemon cucumbers, a result of me taking pollinating into my own hands. It probably will not ripen in time, but I'm enjoying watching it develop along with all the smaller siblings on the cucumber vine. I'm definitely going to grow lemon cucumbers in the garden next year and the year after that. Perhaps, the fact that I started mine so late have contributed to this, but I find them to be great candidates for a container garden because the vines aren't unruly. At only about five feet long the vine is flush with developing fruits, which leads me to believe it could easily be grown in small garden like a balcony or fire escape garden. Lemon cucumbers aren't some crazy hybrid between lemons and cucumbers. 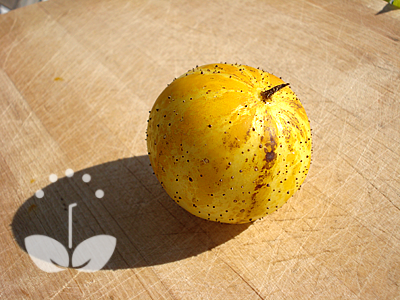 The name for this weird vegetable is derived from the yellow, lemon-shaped fruit; which is said to be sweeter than regular cucumbers and not sour like the name or color would imply. My lemon cucumber vine has withered down to virtually nothing, but the only cucumber that managed to form enough was harvested today. I noticed the spines sort of lost their sharpness and were easy to rub off. The second thing I noticed about the cucumber was the two tones in the skin. I Don't think the photo does it much justice, but it was really "pretty" and shimmered in the sunlight kind of like a Christmas tree ornament. Inside the cucumber looks like all other cucumbers you've seen, with the exception that this one is round. The power of suggestion seemed to influence how my taste buds reacted to the flavor. I would swear in a court of law that the lemon cucumber has a bit of a citrus taste, but nobody else I shared it with mentioned anything similar. What we all did say about it smelled like an average cucumber but these were definitely a lot sweeter. Next year I'll plant a whole bunch of these cucumbers. If you're interested in growing these you can buy the seeds from Botanical Interests, who supplied me with my pack to try. 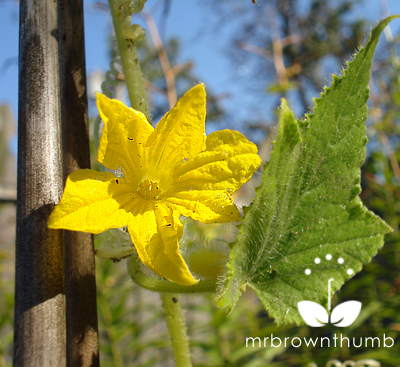 If you're having problems with your cucumber plants because they are flowering but not producing fruit, see my post on How to Pollinate Cucumber Flowers. Sounds like a nice vege to eat in salad. Thanks for your explaination in the last paragraph. 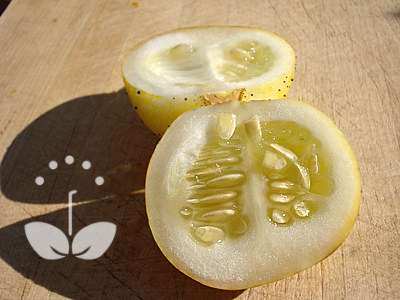 From the beginning I really thought that this is a hybrid of lemon and cucumber. Also I was surprised to know that dried Allium stalk is so robust. Thanks for sharing these great info. Have a great day MTB! Sorry you are having such a hard time with your cucumber plant. I grew this variety a few years ago in a container trough and got an abundance of fruit. One thing I noticed about this variety is that it needs lots and lots of water to keep the leaves from turning brown, shriveling up and dying. I harvested plenty of fruit but the first one I tasted made my heart sink. The flavor was not one I cared for at all! It was sure fun to grow this odd looking plant though. I absolutely LOVE "Lemon Cucumbers"!! They are one of the most crisp cucumbers I have ever had and are delicious in salads! Yum, yum, yum! I am so jealous. Your post has reminded me to try and find some seeds for next year! Thanks for such great post. I think more people should try growing "Lemon Cucumbers". I wonder if people are scared off by the spiky bits on the fruit? I too have huge pumpkin vines with absolutely no pumpkins. It never occurred to me to hand pollinate. I guess I will have to search through your blog on how to do that too! Well now...these do sound good for portability! I may be able to do this myself!!! Do you think it could be contained on a large upsidedown tomato trellis??? P.S. Could you move your whole operation inside by a window to let them finish growing, or no??? I've eaten these, MBT, and they're pleasant, but I like them more for their aesthetic qualities than for their flavour. Haven't had them in pickles, which I must rectify. I got some lemon cuke seeds as a bonus with one of my seed orders last year and I was really impressed! They grew like gangbusters and I found that they worked very well mixed with regular cukes in a salad (chop, mix with olive oil and vinegar and spices to taste). A neat veggie that I've never seen in a store! They sound great tasting and cool looking. I look forward to trying them next summer. I haven't tried them yet, but have considered it. I grew 'Straight Eight' and another variety I can't remember at the moment. Cukes were definitely the most productive veggie I grew this year. They're all done now, having developed mildew or some fungus, but wow, there were lots of them. I even made some delicious (if I say so myself,) cold-processed pickles - six jars of them, and a few cucumbers ended up in the compost when we couldn't keep up with eating them all. I don't know how nice it will be to eat, I'm hoping I will know and maybe this warm weather keeps up and the one in the pic gets to ripen. That's cool, I wish I had know they were selling this cucumber at Home Depot, maybe I would've picked up a couple of starts there and compared my growth results. Hi, Thanks for stopping by and commenting and giving me that watering tip. I'll have to keep it in mind when I grow them next year. You should do it, it is a lot of fun. At least it is to me. Plus if you have people nearby you who don't know what you're doing you get to look all weird as you go from flower to flower with a little paint brush passing pollen from plant to plant. Thanks for your feeback about eating lemon cucumbers before. Good luck with the hand pollination. Do you mean portability in terms of moving the container around or terms of their round shape making it easier to take the fruit around with you? Hope you do. Let me know how they work out. I was suppose to grow Japanese Burpless Cukes but didn't get around to them. You know, I'm really excited about the Melon 'Banana' we got from Baker Creek. May end up starting a theme garden, veggie garden of plants named after fruits. Do you think so? It looks a bit scary to me, what with all the spikes. Imagine having to eat one like an apple-ouch! I've never even heard of these before. Your story has prompted this strictly ornamental / non-veggie gardener to put this on her need to try list! I hope you did give them a try. But if I did that I wouldn't be able to save any of the seeds now would I? LOL. Thanks for the tip, though. I'm make sure to let some go to seed and harvest others earlier to get more fleshy fruit. Congrats on your purchase and good luck with pollinating your blooms. Hope you get a good harvest of lemon cucumbers. Hi Anonymous, Thanks for the tip on harvesting the lemon cucumbers. Diyavsupply, Good luck with your lemon cucumbers! I grew one of these this year and it tried to takeover my garden! It sent vines out about 6-8 feet every direction, and was twining around my sunflowers on one side and taking down the pepper plants on the other. 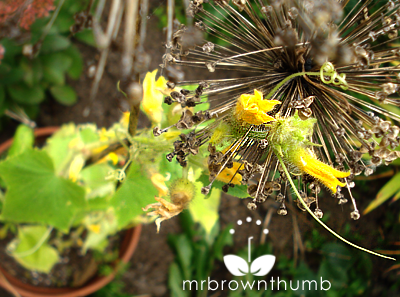 My plant was also loaded with blossoms, but I only harvested 7 or 8 small cucumbers. I didn't think to hand-pollinate. So I wasn't super impressed. The flavor was good but not worth all the space it used up for such a small harvest! Been growing lemon cucumbers for three years now. Always a favourite due to there rustic appearance and crisp taste. An abundance of cucumbers is very normal from this plant. The only issue I've had is x pollination with Crystal Apple cucumbers. Good luck worth the effort. I have always, always tasted the vaguest hint of lemon in these cukes... You're not alone. got some mixed in with normal cucumber seeds... thought they were canteloupes before the rind (cause i planted canteloupes right next to them) LOL LOL LOL loved them and saved some seeds- they're coming in GREAT from my seeds... so fun!